kadsur: 55 and Not out...!!!! It is an attempt to share my feelings, highs, lows, kick, motivation, drive and frustration for a cause called voluntary blood donation. It was just then I crossed 18 years of age, my mother was under going a surgery and needed 3 units of blood. Me and mother happened to be of same blood group, B+ve. Naturally I was the preferred choice. We happened to live in a town by name Sagar (it is a taluk head quarter and 350 kms away from Bengaluru and happened to be 30 kms before jog falls). It didn't had a blood bank that point of time. Need to travel to Shimoga that is 75 kms from Sagar. We went to Shimoga and we are there just before the blood bank opened for the day. Completed the formality of donating blood (that took close to an hour plus). After that they took another 1 hour to complete the testing and making some report ready. They gave the blood in a thick plastic cover filled with ice cubes. Then travel back to Sagar by bus. Even though it was well connected, we could manage to get the last rows in the bus. As we started nearing Sagar ice started melting and it is our own blood so strange feeling. As I have donated blood for the first time, even though I was feeling light and great. I was feeling bit restless, close 160+ kms travelling in bus, first donation, carrying blood all these were adding to it. We reached safely and mother got operated, everything went well, that is how my journey started. Some how I was consistent on donating once in 3 months. I kept a good track of it and quite motivated to perform on a regular basis. It went on for next few years, as my journey of life took me to different places, I donated blood in Mumbai, Bengaluru, Mysore, Tumkur, Hassan and Hubli. Even though it is in scarce and saves the life of people, what keeps me wondering is attitude of the people. I yet to meet some one/some family who received the blood is showing some gratitude towards the donor. 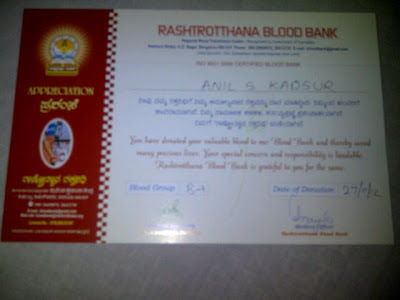 Few years before whenever I was going for blood donation, I never remembered me going alone. I always made it a point get a friend of mine and influence him to donate. The way the people have been treating us started upsetting them. Even though I was not disturbed I found it extremely difficult to motivate others after such instances. Off late I dropped the idea of taking someone for the voluntary donation. Some of important mentions of my good friends who donated blood with me for couple of times are, Ashok, Pradeep, Nagaraj, Ajay, Satya babu, Priya, Sandhya (i thank them for making the difference). Where my voluntary donation happens. 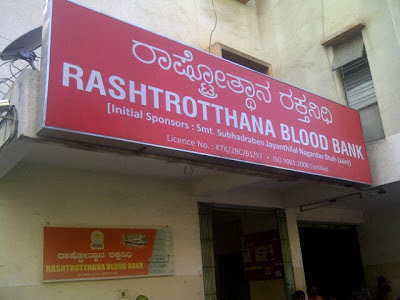 The most common thing that happens is, my cell phone number is registered in most of the blood banks in bengaluru and in some on line directories. I keep getting calls for the requirement of blood. When I am eligible for donation, I say yes for donation, it will be in some hospital. They tell the patient name, I need to visit that hospital blood bank. Here what was disturbing us is, we go there and record the patient name and donate blood. No one from the patient side, will neither be present nor say a word of 'thank you'. I do understand they are in hospital and need to take care of lot of things. At least what they can do is, some body from their side, can call us whenever they get time appreciate this noble cause, which must saved their son, daughter, wife, husband, father, mother, brother or sister. How surprising it is for some one like me, till date don't have an instance to quote appreciating us with a simple 'thank you'. Is this how most of the donors are treated, if yes, no wonder this may be one of the reason for the gap in annual requirement of blood per year is 12 million units and only 9 million units are been donated (figures are for the entire country). I personally feel unless this changes, quite tough to bridge the gap (no doubt, myth and fear about the donation is a major issue)point is what is happening to repetitive donors. To go into more details the above 7 people, did do their first donation with me. Collectively must have done 30 donations so far. In last 5 years donations from those 7 of my friends is very negligible, probably that has a message. If you are reading and wondering why am stressing it so much, let me quote one of the recent donations what I did. I was in the heart of the city (close M G Road) I received a call from a patients relative telling he needs blood and patient is Narayana Hrudayalaya. I said yes am coming, I went all the way to Narayana Hrudayalaya and completed the donation and returned to my work, I need not mention the case is like the above one. It took almost 4 plus hours doesn't it deserve a better treatment. With all this am thankful to Super Power (now a days not using the word God and using alternative names, is more fancy, hehe) for the journey that is still on. When I started this journey never thought could come this far, however few years back set a goal to myself some day I should cross 130 donations, as on today I stand at 55 donations and that took me 15 years!!!! Thank you Ram. Good you liked it. You gave a new dimension to my thinking here, honestly i never looked at it that way. It makes an absolute sense. I appreciate your opinions, please express what you feel, thank you for your time. 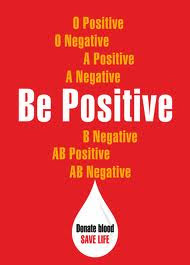 It is better to donate once every three months in a blood bank, that way the donation is secret and there is no expectation from the anonymous recipient. The very act of giving is such a high, it's next only to a runner's high for me. Thank you Vishy sir. I completely agree with you, probably that is how i found blood bank more comfortable off late. I was over joyed to see your comment here, thank you sir. Very inspiring article Anil... need to discuss this further next time we meet. I think, donating blood, eyes and other organs,i believe is a very noble deed, and best handled anonymously. In real life, while you would have easily got a "Thank you", for giving somebody a lift, or giving directions to somebody to reach a place, whereas as you say "till date don't have an instance to quote appreciating us with a simple 'thank you'." - for donating the life giving blood. I think its because sub consciously, every one knows the enormous value of the blood or organs, and think just a "thank you" is not enough to cover it, so people just keep quite. Some are just afraid, everyone is not like Anil :) and wont be happy with just a thank you... and there might be other expectations. Keep at your good work Anil.. i am sure recipients all say "Thank you" from their heart .. for they wont be alive without this invaluable act from kind people like you :). Thank you Prakash. Sure will discuss when we meet next time. I got your point, makes sense. As you rightly said, the work continues irrespective of how people treat me. Keep up the good work, Anil! Have done this before so I know how good it feels. Thank you Mohan. True you are right, appreciate your interest in that area too. Anil, Your blogs are eyeopeners and nice to read, keep it going Anil. Thank you Sanjay. Happy it made some impact. As a consistent blood donar for 40 years now, I can appreciate what you are saying and how you are feeling. I have always donated through a blood bank (American Red Cross) and never directly for a specific patient. I've offered to do so, but the opportunity simply never presented itself. Because I am donating to a blood bank, it never occurred to me that someone (besides the American Red Cross workers)would thank me for my donation. I do it because it's needed. I do it because it makes me feel good to do it. 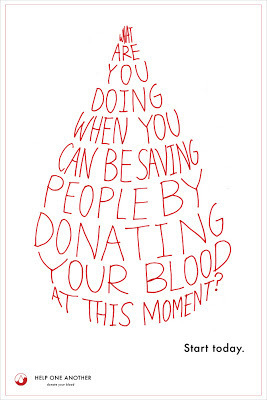 And I do it because it seems absurd that with so many healthy people out there, we still experience regular blood shortages. I can understand how a patient receiving your blood might not be aware of your special efforts made on their behalf. They might think to thank the hospital, the doctor, the staff ... but not the people who prepared their nutrition, made the room clean and as pleasant as possible or the people who donated the blood. I'm not excusing them, but I can understand it. I estimate that over my 40 years of donating, I've given 120 pints of blood. I am unaware of a single patient who received my blood. I can only assume it has happened, but I'm not aware of it. And that's okay with me. In my heart I know I have helped to make one, small difference. Whether my donation was used for research or given directly to a patient is irrelevant to me. As an aside, I have been making a double red blood cell donation. The procedure takes a little longer (not much though) and it takes longer to recover, but you only go half as often. If this is an option available to you, please check it out. 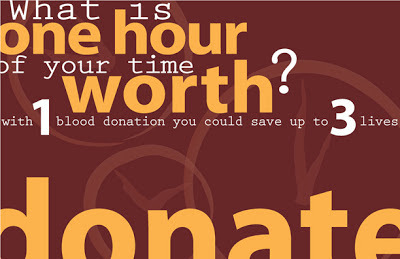 You might find it much more convenient than donating every 3 months. Thanks for sharing your thoughts on this through this post. Thank you Scott, for taking the time to reply. You are my inspiration and you gave a new meaning to this, sorry for the delayed response (was too busy with work). You make absolute sense. Anil I know you and I know your deeds since 11 years. You are a true gentleman. .
Anil Congratulations, This is one of the milestones you have reached. And I am pretty much happy to say you lead we follow! Thank you Aparna, can understand it is great place to be in, keep up the good work. Thank you Ganesh, happy i made a difference, appreciating your honesty for passing the credit to me, for you doing the good work.